Bulletin Insert for April 21, 2019. Description: For Easter Sunday, this bulletin insert is a reflection about the cross as the doorway into heaven. Experiencing the glory of the celebration of Easter — deep within our hearts, within our needs, within our desires — began with accepting our sorrows and sacrifices and sufferings are our own personal connections to Jesus. And now, Easter joy comes not only from accepting what Jesus did for you on the cross but also from continuing the journey, side by side, step by step with Jesus. 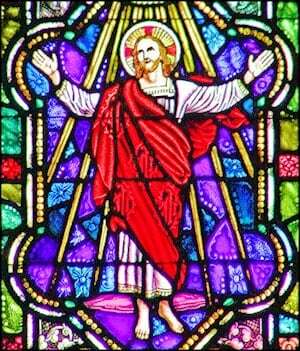 Easter Sunday Mass is the celebration of rising with Jesus into glorious victory over evil. Ideas for use: Bulletin insert for April 21, handout for adult education, faith sharing groups, RCIA class, etc.